Biodegradable Bone Graft Polymers Market size was over USD 350 million in 2016 and will grow at a CAGR over 7.5% over the projected period. Bone grafting methods have undergone a shift from traditional autologous and allogeneic bone grafts to synthetic bone grafts primarily due to biocompatibility and biodegradability properties of synthetic polymers. Natural biodegradable polymers such as chitosan and collagen have been widely researched for the same purposes, as they are significantly lower in cost and can provide mechanical strength. Chitosan is widely used in implants such as tacks, anchors, arrows, needles and screws in shoulder & knee surgeries as it has no cytotoxic effects and it can be easily molded. Chitosan is also used in arthroscopy, bone fixation, spine and craniomaxilliofacial application. Polylactic acid is the most important and widely used polymer for bone grafts because of its exception strength and biodegradable properties. Polylactic acid (PLA) is frequently combined with different polymers to form poly-L-lactic acid (PLLA) which are widely used in carriers scaffolds, membranes for internal fixation purposes. Bone grafting is widely used in dental application market because of rise in cases of tooth loss globally. Joint reconstruction, which includes knee & hip joints, are important sub-application for biodegradable polymers. This can be attributed to an overall rise in hip fractures cases globally, either due to accidents or also joint degradation with age. Global hip and knee orthopedic surgical implant markets will achieve rapid growth owing to rise in aging world population. Approximately one million Americans had undergone total knee or hip replacements in 2016. Companies such as Zimmer, Medtronic, Depuy Synthes are some of the major players in the bone graft market. Innovative product designs and advancements in robotics, rise in 3D printing devices, smart implants, nanotechnology, biologics and tissue engineering will contribute to the market growth for bone graft polymers. North America dominated the biodegradable polymers market for bone graft application due to high prevalence of obesity and osteoarthritis and high costs incurred per device. Over the next 5 years, Asia Pacific market for biodegradable bone graft polymers is expected to garner a larger revenue share as compared to other markets because of rise in healthcare spending by India, China, Thailand, Malaysia and South Korea. Bone graft for dental implants is another growing application in Europe. It accounted for about 40% of the dental implant market, followed by North America. About 18-20% of U.S. population was above the age of 60, and this could rise to over 22% by 2024. This poses opportunities in dental applications due to larger risk of tooth loss and decay with age. However, as dental implant costs are not covered by most healthcare insurance plans, demand for bone grafts can be subdued to some extent, as people can opt for cheaper solutions. Some of the major players in the dental implants market are Straumann, Nobel Biocare, Zimmer Dental among others. Tissue regeneration products and dental membranes market are projected to gain momentum in Europe and North American region owning to high spending on oral health. The demand for biodegradable bone graft polymers will grow at a healthy rate due to rise in population, improvements in healthcare facilities in developing countries, rise in medical tourism facilities, innovative technologies and design, and rising purchaisng power on healthcare facilities globally. Developing countries such as China, India, Malaysia and Thailand will be potential markets for bone grafts in coming years as the prices of implants in these countries could drop considerably with growing demand and local manufacturing opportunities. In Europe, countries such as France and UK display good growth potential as the market has undergone comparatively lesser penetration over North America. Brazil offers a strong potential for bone grafts as about 2 million dental implants are done every year and the number is growing. Mexico is one of the growing market and will show some traction in coming years. As constant innovations are taking place in the bone graft materials industry, new materials such as ceramic composites, metals etc. can hinder the growth of bone graft polymers to some extent. Joint reconstruction (knee, hip and extremities) was the largest application in 2016 and will grow second fastest followed by spine applications in terms of CAGR in the forecasted period. Rise in population, improved medical facilities and insurance coverage will be some of the drivers for the joint reconstruction application market. Spinal fusion application is estimated to be the fastest growing market during the forecasted period especially in North America & Europe owing to rise in old population and rise in degenerative disc disease. Craniomaxilliofacial (head, neck, face) applications is projected to remain steady growing along with ortho biologics applications during forecast period. The report includes market analysis of various biodegradable bone graft polymers such as polylactic acid (PLA), poly glycolic acid (PG), polycaprolactone (PCL), chitosan and collagen. PLA, PG & PCL are classified under synthetic polymers whereas chitosan and collagen are classified as natural polymers. 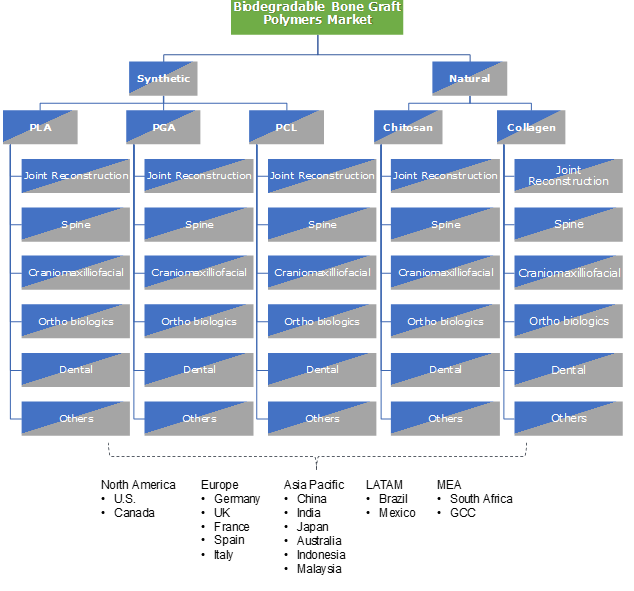 Polylactic acid accounted for the largest share in the market as it is most widely researched material and can be combined to form different copolymers such as PLLA, Poly D-lactic acid (PDLA) and others. Polyglycolic acid was widely used in absorbable sutures and has a global reach, making the segment an important driving force for biodegradable bone graft polymers. Copolymers made from PLLA polymer (poly-l-lactic acid) and PLLA-PGA copolymer are gaining share in the total synthetic bone graft materials market. These materials degrade on their own and need not be removed surgically after healing process has completed. These copolymers are prominently used in the orofacial area, reducing the need for additional plastic surgeries, particularly in case of fractures. Natural polymer materials such as chitosan and collagen are gaining importance as they are degradable and biocompatible & can be used as bone graft materials. Chitosan is a flexible material and can be converted into fibers, membranes, 3D scaffolds and injectable materials. 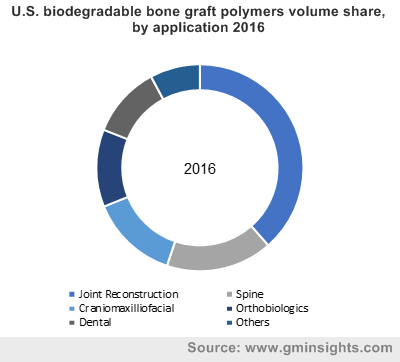 Geographically, North America is forecasted to be the largest market of biodegradable bone graft polymers by 2024 owing to rise in old population and increase in lifestyle diseases such as obesity and others. Europe Biodegradable bone graft polymers market size was more than USD 90 million by 2016 and is estimated to grow at a steady rate. Rising demand and awareness from developing countries in Eastern Europe will fuel the growth of biodegradable bone graft polymers. Germany was the largest market for biodegradable bone graft polymers in 2016 in Europe. Major Biodegradable bone graft polymers market players are Evonik, Corbion N.V., Polysciences Inc, KLS Martin, Foster Corporation and others. Key biodegradable bone graft polymers market contributors are engaged in expanding their product portfolio by introducing innovative copolymers materials for bone graft and implant applications. Key manufacturers have focused a large part of their efforts on R&D and new product development with a variety of materials including smart materials. The market is currently fragmented and could get consolidated in the future with entry of large manufacturers from Asia Pacific in the coming years. Biodegradable bone graft polymers are natural or synthetic polymers which are biodegradable and are fit for medical use. These polymers are used in various form such as pins, membranes, screws, arrows etc to provide mechanical strength to the surgical area. The basic advantage of these materials are that they are resorbable in nature and no second process is required for removing it. The time required to dissolve depends on the material used. The major companies in this market are expected to have a noteworthy market share in the coming years. New companies entering and targeting present players will help the biodegradable bone graft polymers manufacturers to overcome the effects of volatile economy, leading to expanded business range and revenue growth.